Nor is this an ordinary portrait. 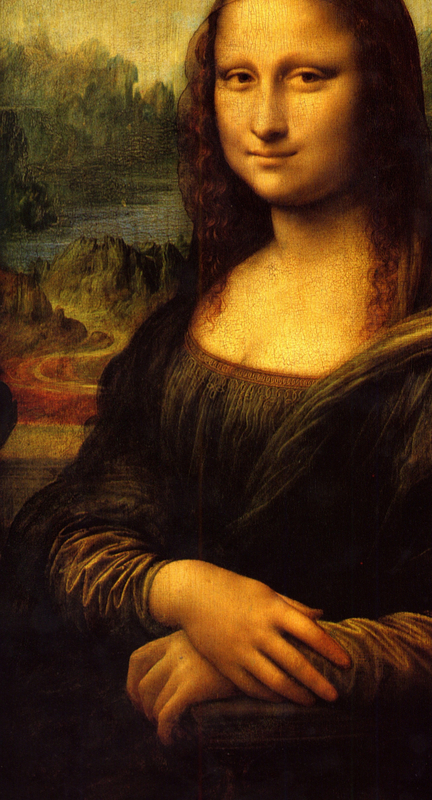 Leonardo kept it with him all his life so the idea that "her father", assuming Lisa is a real person, commissioned this work is ludicrous. Just look at the setting. She sits an arm chair in front of a stone balustrade thousands of feet up into the sky above a mountain range so terrifying that it looks like no place on earth. This is also said to be the first female portrait in which the sitter is unequivocally sitting. Kenneth Keele, a doctor and art historian, noted in 1959 that she has physical signs of pregnancy. Like women at full term everywhere, she sits well back in a comfortable chair, her back straight and well supported. Her face and neck are also slightly puffy and her bosom full, common signs of pregnancy. The size of her abdomen is carefully concealed but her wrists and fingers are puffy too, all rings removed, something many women are forced to do late in pregnancy. 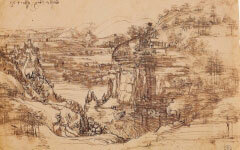 Despite academic skepticism today Leonardo himself wrote that there is an automatic tendency in painters to produce figures which ‘resemble their masters’ while an acquaintance of Leonardo’s in Milan mocked him for making his figures look like himself. 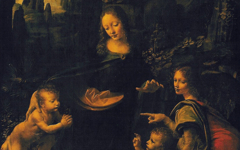 It therefore seems probable that the Mona Lisa is Leonardo's conception of the female muse in his own mind who gives birth to his conceptions. That's why she's pregnant and looks like him. This also explains why he never gave the portrait away. 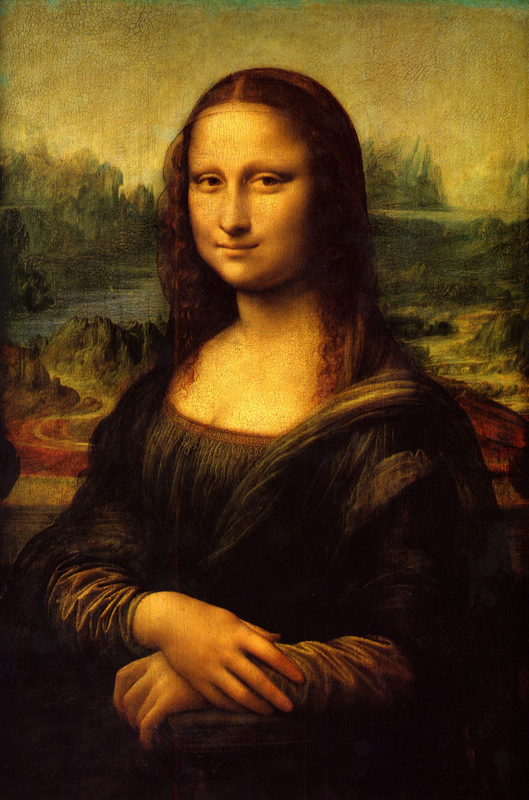 Put another way, the Mona Lisa is a personification of the creative element in his mind which, in turn, explains why the mountain range beneath her is so vast. His mind (the painting) is at one with the cosmos and is ancient too, full of wisdom. 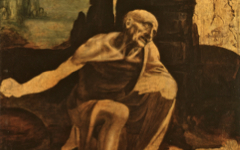 Unlike today, people in the Renaissance believed that the ancients, especially the Egyptians, were far more wise than they were, closer to the origin of man. They admired them and their understanding of humanity. For the past three years this website has also demonstrated that major artists in almost every period since the Renaissance have fused their own features onto portraits of others bringing into doubt the long-held belief that portraits in general are the early equivalent of a photograph. 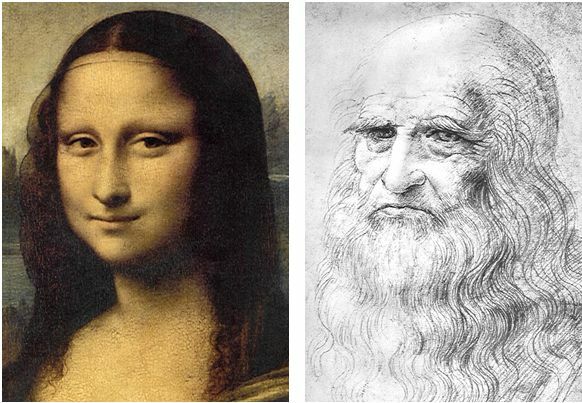 See similar examples in Face Fusion and our entry on Ingres' Comtesse d'Haussonville. Keep reading the other entries too because the more you see, the more you'll see. What are we looking at in this strange masterpiece? First published online April 13th 2010; reposted Jan 7th 2013. 1. Lillian Schwartz,“The Art Historian’s Computer”, Scientific American 272, April 1995, pp. 106-11. Original Publication Date on EPPH: 07 Jan 2013. © Simon Abrahams. Articles on this site are the copyright of Simon Abrahams. To use copyrighted material in print or other media for purposes beyond 'fair use', you must obtain permission from the copyright owner. Websites may link to this page without permission (please do) but may not reproduce the material on their own site without crediting Simon Abrahams and EPPH.